1.) Whenever I run a sample nothing but net program I am required to log into CS2N or login locally. Why? 2.) After I log in (to CS2N or Local Login) I continually get a Disconnnect Joystick error on the playing field screen. Do I really have to unplug the USB each time I start a match? Once the autonomous period expires I plug the joystick in an all is well. This seems to be a pain to have to do. Am I missing something? 3.) The gyroscope for the lauchbot in rvw does not seem to be used although the sample robotc autonomous program for launchbot uses one. Is this true? There is also an option to Log in as guest. This option is on the local tab. There will be no data saved if you choose this option. This is correct. A USB Joystick cannot be plugged into the computer during the autonomous period, and programming skills challenge. Once the autonomous period ends, you can plug your joystick back into your machine for the driving period. This is to ensure that the competitions rules are enforced. You are correct, the Launchbot does not have a gyro sensor configured to the robot, so the sample program should not be using the gyro sensor. 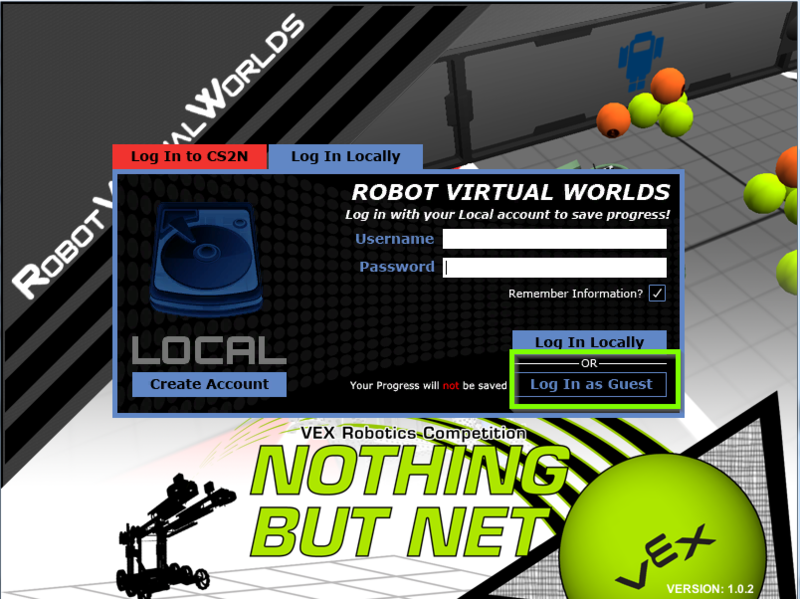 Nothing but Net has a few different sample programs that are robot specific (Launchbot vs. Kickerbot). The samples for the launchbot do not appear to use a gyro, but some of the sample programs for the kickerbot use this sensor. You can see which robot the program is for by the file name and the comments at the top of each program.